I was recently reading Apartment Therapy’s post on warm and cool people (find by clicking here) and their design styles. I am definitely a warm person. 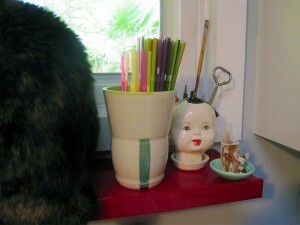 Rob and I have created a home full of tchotchkes and things that make us smile. Our problems are weeding out stuff we don’t use and organizing the stuff we do use. (Rob may be a cool person on his own, but with me, he has no choice but to be warm.) I have been trying very hard to keep lots of negative spaces in our new home & not fill everything to the brim with stuff! 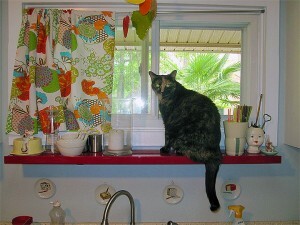 That said, I love my kitchen window and looking out while I’m working in the kitchen at the neighborhood. My cats love sitting up there too! In this picture, we see the window in it’s full glory. The mobile hanging above is a fruit mobile that I remember as always having hung in my grandparents kitchen until they both passed away. 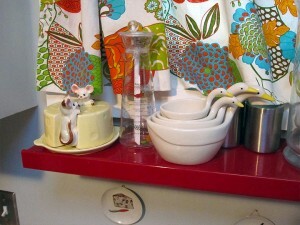 The shelf itself is from Ikea; it’s the Marginal shelf with retaining edge (a must in the kitchen). Hanging below the shelf are some cheese plates I got at a second-hand store that function as both my homage to glorious cheese and an ironic reminder to my husband that he is very weird (in that he does not eat cheese). Texas (the fat cat) doesn’t always sit there, but she makes an awesome addition when she does! The large candle next to Texas was an awesome housewarming gift from aunt & uncle when I moved into my last apartment. In this picture you see another cute cheese dish from a second-hand shop (more irony for Rob), a really handy vinaigrette mixer my Mom gave us, and geese measuring cups from Anthropologie (another gift from Mom). There’s also some older Ikea stainless steel storage cups in the background; we use those to collect rubber bands and paper clips. 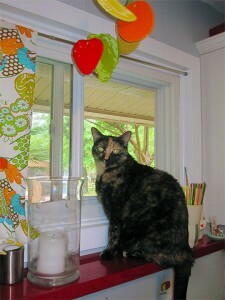 The curtain is from Pier 1, and I love the colors! 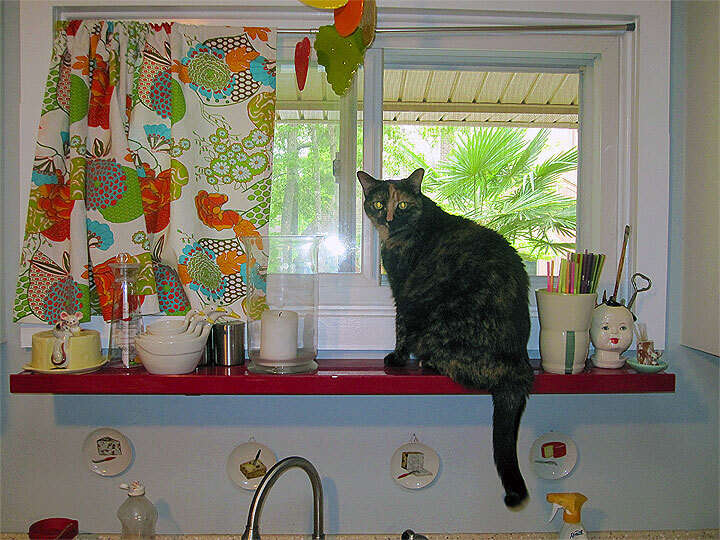 In this photo, you see the back of previously noted fat cat Texas (she’s such a sweetie). A gorgeous vase my friend Justine gave Rob and me for our wedding (it has our birthstone greens in it–the theme colors from our wedding–peridot & emerald) that displays/dispenses our collection of straws. I love the vase too much; I have to use it for something besides flowers, so it can stay out all the time. There’s also a handpainted antique dollhead from Etsy filled with pens, paintbrushes, and a bottle opener, a sake cup/dish from my friend Mariko’s wedding (coolest touch during the ceremony for everyone to drink/toast with the bride & groom), and a little second-hand deer toothpick holder. And to end, one more picture of my gorgeous cat!